Key powers have agreed that the United Nations' nuclear watchdog, the IAEA, should report Iran to the Security Council over its nuclear programme. However, ministers from the US, the EU, Russia and China added that the council would take no action until March, after it had received a report from the IAEA. Iran said sending the case to the UN would mean "the end of diplomacy". The EU and the US suspect Iran is aiming to build nuclear weapons - but Tehran says its programme is peaceful. The agreement on Iran came after late-night talks between of the five permanent members of the Security Council plus Germany, aimed at co-ordinating their position ahead of a meeting of the International Atomic Energy Agency (IAEA) on Thursday. The move stops short of the formal referral urged by the US, Britain and France. BBC diplomatic correspondent James Robbins says the decision to choose the weaker option of reporting Tehran to the council acknowledges divisions among members. It leaves open the possibility of stronger action at the March meeting, if Iran does not back away from its uranium-enrichment programme. But a US diplomat told Reuters news agency: "This is the most powerful message we could have hoped for." The foreign ministers' statement called for "an extensive period of confidence-building" by Tehran, following its recent decision to break IAEA seals on its nuclear facilities. Iran reacted angrily to the London announcement. "We consider any referral or report of Iran to the Security Council as the end of diplomacy," nuclear negotiator Ali Larijani was quoted as saying by state television. 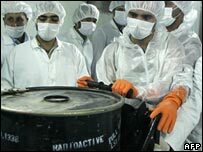 Earlier, the head of Iran's Atomic Energy Organisation, Gholamreza Aghazadeh, said the moves had "no legal basis". US President George W Bush, previewing his State of the Union speech to be delivered on Tuesday, said he would have separate messages for the Iranian people and their government. "And in speaking to the people, my message is this: 'You know, we're not going to tell you how to live your life, but we would like you to be free'," he said. "But to the government, our message is that if you want to be a part of the family of nations, give up your nuclear weapons ambitions." He added: "We're united in our goal to keep the Iranians from having a weapon, and we're working on the tactics necessary to continue putting a united front out." Iran insists it should be allowed to develop nuclear technology, but other key powers do not want it to produce its own enriched uranium, which can be used in nuclear weapons as well as power plants.